carriewriterblog: Are You Pleasantly Surprised, and What Does This Have to Do with Toothpaste? Are You Pleasantly Surprised, and What Does This Have to Do with Toothpaste? I recently attended an event where one of the key aspects was a "goody bag" that all participants received at the end. Having never attended before, my expectations were that I would really enjoy the event, and be so-so about the goody bag. Rather, the reverse happened. The event was not great, as it featured many vendors that did not thrill me, and other items for sale that were really not my taste. Liquor was a focal point of the evening, and since I don't drink, that didn't thrill me either. Plus, I was hungry and there was no food. Zero. Not a potato chip or a cookie or even a carrot stick to be found. You get the picture. I was just about to write off the entire experience, when I came upon a tube of toothpaste. This in itself was not exciting. I just happened to need some toothepaste, so I put it in the bathroom and that night, thought I'd try it out. What was interesting was not so much the toothpaste, but its unique cap, which was designed in such a way as to open both from the top as a screw on, and on the side, as a flip up. This was a novelty. I stared at it again a few times, trying both ways out of curiosity. 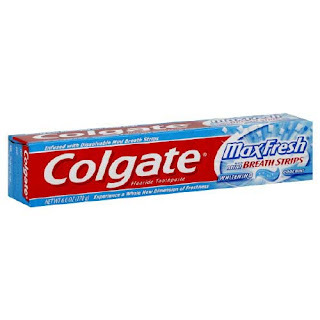 It was only after noticing that the tube of toothpaste could be opened both ways, that I bothered to look at exactly what brand it was: "Colgate Max Fresh with Breath Stripes!" Interesting, I thought to myself. Would I ever use the cap both ways? Probably not, as I was more of a twist off then flap up kind of gal. Still, it was nice to know the option was there. So, the Colgate was the big winner of the evening, and the goody bag. I began to happily brush as I recited to myself, and now to you, the day's marketing lesson: offer your customers some choice where they least expect it, and they'll remember who you are.